...what paper crafter among us doesn't have a ton-o-stuff piled on shelves?! I'm thinking it would be a hoot to take a few minutes this weekend to arrange my overloaded bookcase to look like a Christmas tree... someone hold me to that, please! Photo credit: Apparently the tree was first featured on hoi pippo with credit given to ijm.nl for the concept, but a search proved fruitless... whoever came up with the idea gets my vote for tongue-in-cheek holiday decor. Brilliant idea to help children quill - twist ties! I hope you'll have a great weekend and thanks so very much for taking the time to visit here, especially at such a hectic time of year. This is such a delightful idea !!! Thanks also for the other links Ann, very useful . I like the creativity and imagination behind this. Fun stuff! Holy cool! What an awesome idea! 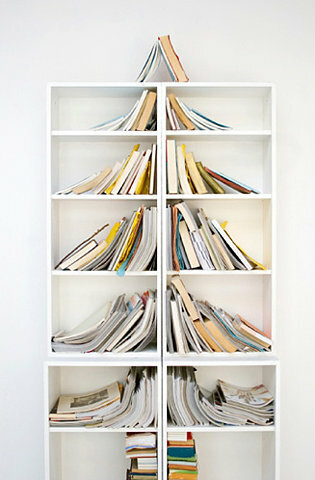 The bookshelf tree is ACE! New to me and it made me laugh and smile...thanks for sharing this clever idea - kudos to the original artist!!! You are great for sharing all those interesting topics and their links. I enjoy your bog so much. Thanks everyone, and Soraya, I'm glad to hear that. Thanks for visiting! This is so good idea!!! Ann, I enjoyed a Christmas roundabout at all the different ideas featured in your f.b.finds and the tree bookshelf is a fantastic idea! !